Hey lovely blog readers! Can you believe it's already March?! Since we rang in the New Year, it feels like time has been set to quick speed. 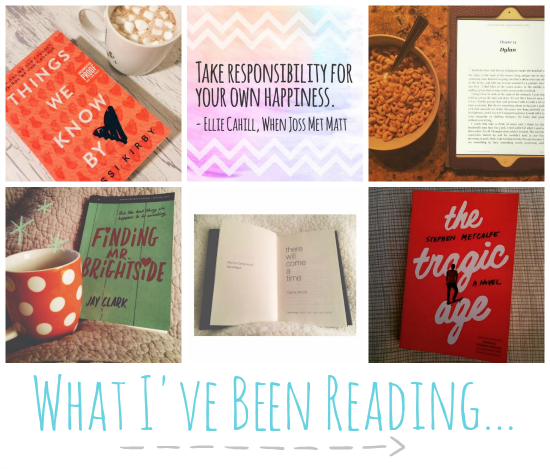 I thought I'd create a blog feature to post sporadically, sort of like a "checking in" type feature, to let my readers know what I've been up to, which books I've received recently, and what is currently on my nightstand. Hope you enjoy this first edition! These are just a few of the finished copies that have shown up in my mailbox the past two months. 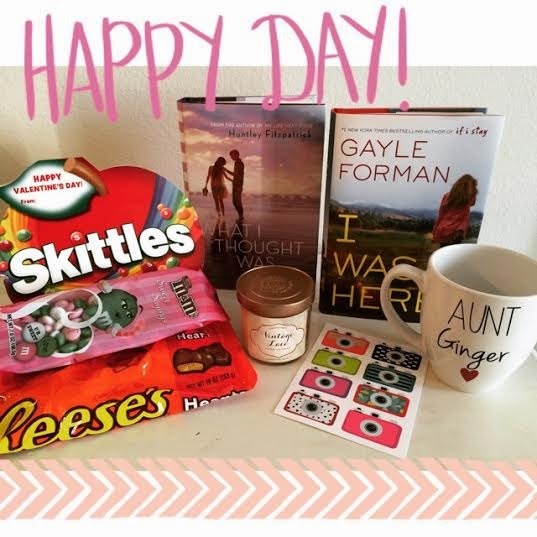 ALL THE BRIGHT PLACES was gifted to me by Carrie (@OneBookishMom), my #OTSPSecretSister from the first round. She showered me with so much happiness over the last 6 months, including this lovely book that's been on my wish list. Hoping to read it SOON! I read an ARC of I'LL MEET YOU THERE back in 2014 and loved it so much that I preordered a finished copy! When this beauty arrived in my mailbox it had me wanting to read it all over again just so I could feel that warm goodness of Heather Demetrios's storytelling. Be sure to check out my blog tour post for this wonderful novel, too. 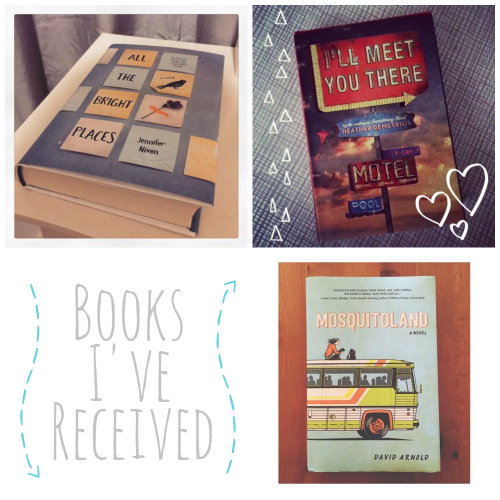 Just recently MOSQUITOLAND arrived in my mailbox, thanks to Penguin Teen! I am planning to read this novel next and cannot wait to see what all the hype is about. I've heard SO MANY good things about this one. Also, I discovered the brilliant music from the same author, David Arnold, that you should definitely check out right here. I became an aunt again in February!! My sister gave birth to a healthy baby girl that has completely stolen all our hearts. Being an aunt is one of the best things EVER (I have three nephews as well). So thankful for my sisters and their beautiful families. Here's a snapshot of some of the books I've read these past several weeks since the new year began. I started the year off with THINGS WE KNOW BY HEART, which happened to be my most anticipated read of 2015 AND a 5 star read at that! Definitely the best way to begin my reading year. I've discovered quite a few New Adult reads that have captured my reading interests, too. WHEN JOSS MET MATT and ALL BROKE DOWN are two of the best NAs I've come across lately. I highly recommend these novels if your thing is New Adult romance. FINDING MR. BRIGHTSIDE and THE TRAGIC AGE are two recent review books that I read -- both offering something unique to the YA contemporary voice, I think. I am slowly making my way through my TBR pile and this one has been sitting on the top of it for almost a year! I'm about half way through THERE WILL COME A TIME and I already know this book is going to break me in the best possible way. Stay tuned for my upcoming reviews! So, what have I been up to these past two months besides reading and becoming an aunt again?! TEACHING!! I started my first job just after the new year and WOW what an experience these past several weeks have been for me. I've worked so hard to get here, and continue to work even harder to be the best I can be. Teaching is all about learning as you grow. There are days I leave physically, mentally, and emotionally exhausted -- but I leave with the feeling that I want to come back the next day, already preparing how I am going to change.. make things better.. approach a certain situation differently. Teaching is by far the hardest job I've ever done, yet the most rewarding, too. I know in my heart this is where I belong. Above is a sneak peek at my classroom (I teach 6th grade Social Studies). Introducing the world and its cultures to students who have never seen outside their own has been an unforgettable experience and I love discovering the world through their eyes as well. What have you been up to since the year started? Favorite books you've read? Please share in the comments below! Thanks for checking in! OOOH you just reminded me of two things 1) that I need to listen to David's music and 2) I really want to add When Joss Met Matt to my TBR bc you and I typically like the same NA (which isn't all that much haha). Cannot wait to start on Jessi's new book soon!!! SO MANY BOOKS I AM SO EXCITED ABOUT. Also, I just am so happy to see you teaching and LOVING IT. You are so inspiring to me as I find myself a little lost job-wise. I want to seek out the thing that gives me this much joy like it does you. Sure, any job there are going to be ups and downs but having that passion and joy helps. And you worked SO HARD TO GET HERE and I'm honored to have seen that journey from pretty much the beginning <333 PROUD OF YOU!! Aww! I've been following you since you were at the beginning of your teaching program, so it so nice to see you in your job and enjoying it. I also taught sixth grade social studies and really enjoyed it! There is so much to cover, but the curriculum is fascinating and can be a lot of fun. I look forward to reading more about your teaching journey in the future! I loved I'll Meet You There! Had to have a finished copy. And that's an awesome gift from your Secret Sis! 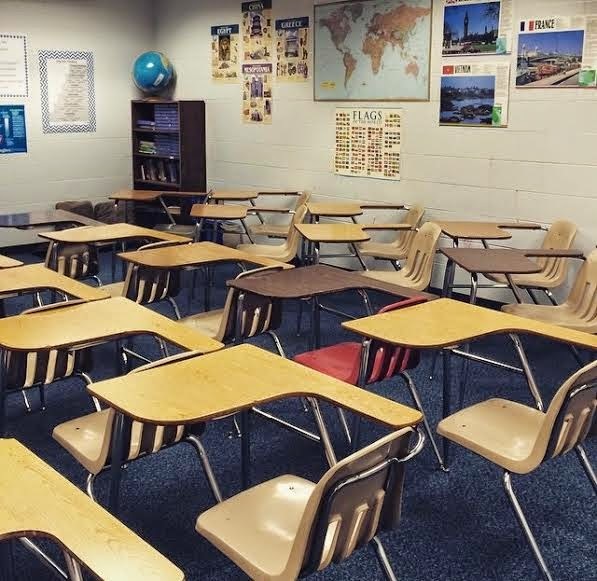 Love the sneak peek at your classroom! I just read Scarlet by A.C. Gaughan and I loved it! Not sure what took me so long. Hopefully I can read Lady Thief soon. What is the #OTSPSecretSister event and how can I get follow it so I can get involved next time? Thank you for any information you can provide me. Congrats on becoming an aunt again! Isn't being an aunt the best? I have 9 nieces & nephews and they give me the greatest joy and happiness. #OTSPSecretSister is so much fun. Participating in it makes me so happy. That mug your new sis sent looks like the perfect gift for you. Congrats on becoming an aunt again! Haha, All Lined Up and When Joss Met Matt are two of the best NAs I've read recently. :D I'm excited to get to All Broke Down!